Lina Mayfleet desperately wants to be a messenger. Instead, she draws the dreaded job of Pipeworks laborer, which means she’ll be working in damp tunnels deep underground. 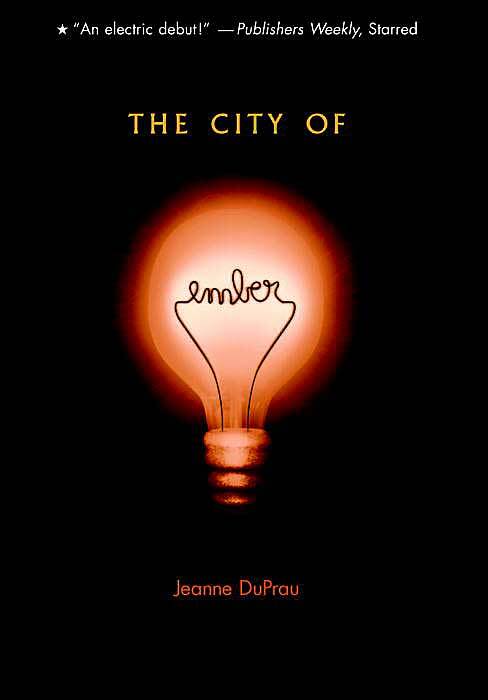 The City of Ember won a lot of awards and I have to admit it was a pretty good debut novel, but it’s not the great literary masterpiece many critics laud it as. The style is simplistic, the characters are stereotypes and the plot was predictable, even when I read it when I was younger. Now that I am older and a more experienced reader, however, Jeanne DuPrau’s novel isn’t as good as everyone seems to think it is. For one, the way Lina discovers the secret to getting out of Ember is far too easy. Her little sister Poppy just happens to be in the closet when the time-locked box opens and even though she chews it, Lina really has no problem placing in the missing words. All she really has to do is ask a few people until finally she brings it to Doon and Clary, the greenhouse worker. For me, it felt like the two of them worked it out a lot more quickly than most 12-year-olds, even highly intelligent ones, would. There weren’t really any serious obstacles in their quest to find the truth; it felt far too easy. Lina and Doon are decent characters, but they’re nothing really to brag about. They feel a bit too perfect and they really don’t make any huge mistakes in their quest for the truth. Doon at least has a flaw—his anger—and it does get the better of him in small incidents, but it never really rises at truly inconvenient times. Lina is pretty much perfect, which probably appeals to the young readers Jeanne DuPrau was targeting, but it does come off as rather annoying to me. However, the target group for this book is ages 8-12 and for that age group, The City of Ember is a good introduction to the world of YA dystopia. The City of Ember was out before dystopia got to be a big trend. It is for the younger crowd. I liked it. Actually, The Giver, one of the better older dystopia novels was out before The City of Ember and the protagonist, Jonas, had to overcome quite a few obstacles. Lina and Doon’s ‘struggle’ didn’t feel all that difficult to me. They caught on to things a bit too quickly for my liking. I definitely agree – I just read this book and even though it’s geared towards more middle grade & younger, I still think it felt a little too easy. It was enjoyable, but not as much as I’d hoped it’d be and seemed pretty easy to figure out. Great review! Thanks! They did catch on rather quickly, seeing as they are twelve years old in the story. When I first read it I wasn’t even in the target age group and I couldn’t figure out what the paper said. The ending is absolutely fantastic, its a shame that the trailers for the movie spoil it though. I’ve watched the movie (a long time ago) and I think it did the story justice. The book was good, but not exactly great in my opinion. Still, it’s a wonderful book to get kids interested in reading. I do agree that the children do overcome the obstacles abnormally quickly. At a young age that kept my attention though, I never really questioned it.